This article is about the geographical and historical region. For the mountain region, see Hijaz Mountains. For other uses, see Hejaz (disambiguation). The Hejaz (/hiːˈdʒæz/; Arabic: ٱلْـحِـجَـاز‎, translit. al-Ḥijāz, lit. 'the Barrier') is a region in the west of present-day Saudi Arabia. The region is so called as it separates the land of the Najd in the east from the land of Tihamah in the west. It is also known as the "Western Province". It is bordered on the west by the Red Sea, on the north by Jordan, on the east by the Najd, and on the south by 'Asir Region. Its largest city is Jeddah, but it is probably better known for the Islamic holy cities of Mecca and Medina. As the site of the two holiest sites in Islam, the Hejaz has significance in the Arab and Islamic historical and political landscape. Below: Map of the Hejaz showing the cities of Jeddah, Mecca, Medina, Tabuk and Yanbu, amongst others that are outside the region. The Saudi Arabian region is outlined in red, and the 1923 Kingdom is in green. The Hejaz is the most populated region in Saudi Arabia; 35% of all Saudis live there. Hejazi Arabic is the most widely spoken dialect in the region. Saudi Hejazis are of ethnically diverse origins. The Hejaz is the most cosmopolitan region in the Arabian Peninsula. People of Hejaz have the most strongly articulated identity of any regional grouping in Saudi Arabia. Their place of origin alienates them from the Saudi state, which invokes different narratives of the history of the Arabian Peninsula. Thus, Hejazis experienced tensions with people of Najd. The city of Al-`Ula in 2012. The city's archaeological sector is in the foreground, with the Hijaz Mountains in the background. One or possibly two megalithic dolmen have been found in the Hijaz. The Hejaz includes both the Mahd adh-Dhahab ("Cradle of the Gold") (23°30′13″N 40°51′35″E﻿ / ﻿23.50361°N 40.85972°E﻿ / 23.50361; 40.85972) and a water source, now dried out, that used to flow 600 miles (970 km) north east to the Persian Gulf via the Wadi Al-Rummah and Wadi Al-Batin system. Archaeological research led by of Boston University and the University of Qassim indicates that the river system was active in 8000 BCE and 2500–3000 BCE. The northern part of the Hejaz was part of the Roman province of Arabia Petraea. Saudi Arabia's first World Heritage Site that was recognized by the United Nations Educational, Scientific and Cultural Organization is that of Al-Hijr. The name "Al-Ḥijr" ("The Land of Stones" or "The Rocky Place") occurs in the Quran, and the site is known for having structures carved into rocks, similar to Petra. Construction of the structures is credited to the people of Thamud. The location is also called "Madā’in Ṣāliḥ" ("Cities of Saleh"), as it is speculated to be the city in which the Islamic Nabī (Prophet) Salih was sent to the people of Thamud. After the disappearance of Thamud from Mada'in Saleh, it came under the influence of other people, such as the Nabataeans, whose capital was Petra. Later, it would lie in a route used by Muslim Pilgrims going to Mecca. According to Arab and Islamic sources, the civilization of Mecca started after Ibrāhīm (Abraham) brought his son Ismā‘īl (Ishmael) and wife Hājar (Hagar) here, for the latter two to stay. Some people from the Yemeni tribe of Jurhum settled with them, and Isma'il reportedly married two women, one after divorcing another, at least one of them from this tribe, and helped his father to construct or re-construct the Ka‘bah ('Cube'), which would have social, religious, political and historical implications for the site and region. For example, in Arab or Islamic belief, the tribe of Quraysh would descend from Isma'il ibn Ibrahim, be based in the vicinity of the Ka'bah, and include Muhammad ibn Abdullah ibn Abdul-Muttalib ibn Hashim ibn Abd Manaf. From the Period of Jāhiliyyah ('Ignorance') to the days of Muhammad, the often-warring Arab tribes would cease their hostilities during the time of Pilgrimage, and go on pilgrimage to Mecca, as inspired by Ibrahim. 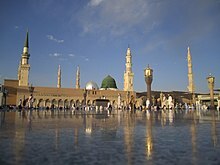 It was during such an occasion that Muhammad met some Medinans who would allow him to migrate to Medina, to escape persecution by his opponents in Mecca. As the land of Mecca and Medina, the Hijaz was where Muhammad was born, and where he founded a Monotheistic Ummah (Community) of followers, bore patience with his foes or struggled against them, migrated from one place to another, preached or implemented his beliefs, lived and died. Given that he had both followers and enemies here, a number of battles or expeditions were carried out in this area, like those of al-Aḥzāb ("the Confederates"), Badr and Ḥunayn. They involved both Meccan companions, such as Hamzah ibn Abdul-Muttalib, Ubaydah ibn al-Harith and Sa`d ibn Abi Waqqas, and Medinan companions. The Hijaz fell under Muhammad's influence as he emerged victorious over his opponents, and was thus a part of his empire. Due to the presence of the two holy cities in the Hijaz, the region was ruled by numerous empires. The Hijaz was at the center of the Rashidun Caliphate, in particular whilst its capital was Medina from 632 to 656 ACE. The region was then under the control of regional powers such as Egypt and the Ottoman Empire, throughout much of its later history. In 1916, Sharif Hussein ibn Ali proclaimed himself King of an independent Hejaz, as a result of the McMahon–Hussein Correspondence. The ensuing Arab Revolt overthrew the Ottoman Empire. In 1924, however, Ibn Ali's authority was replaced by that of Ibn Saud of the Najd. At first, Ibn Saud ruled the two as separate units, though they became known as the Kingdom of Hejaz and Nejd. Later they were formally combined as the Kingdom of Saudi Arabia. Black Standard deployed as dynastic color by the Abbasid Caliphate (750–1258), (1261–1517). Flag of the Ayyubid dynasty (1171–1254). Flag of the Mamluk Sultanate (1254–1517). Flag of the Ottoman Empire (1517–1916). Flag of the Kingdom of Hejaz (1916–1925). Flag of the Kingdom of Saudi Arabia (1925–present). The region is located along the Red Sea Rift. It is also known for its darker, more volcanic sand. Depending on the previous definition, the Hejaz includes the high mountains of Sarawat, which topographically separate the Najd from Tehamah. Bdellium plants are also abundant in the Hijaz. As a component of Saudi Vision 2030, a 28,000 square kilometer tourism destination is under development on the Red Sea coast between the towns of Umluj (25°03′00″N 37°15′54″E﻿ / ﻿25.0500°N 37.2651°E﻿ / 25.0500; 37.2651) and Al-Wajh (26°14′12″N 36°28′08″E﻿ / ﻿26.2366°N 36.4689°E﻿ / 26.2366; 36.4689), in the northern section of the Hejazi coast. The project will involve "the development of 22 of the 90+ islands" that lie along the coast to create a "fully integrated luxury mixed-use destination." and will be "governed by laws on par with international standards". People of Hejaz, who feel particularly connected to the holy places of Mecca and Medina, have probably the most strongly articulated identity of any regional grouping in Saudi Arabia. The people of Hejaz have never fully accommodated to Saudi rule and their Wahhabi religion. They continue to be Sunni of Maliki rite with a Shia minority in the cities of Medina, Mecca and Jeddah. Many consider themselves more cosmopolitan because Hejaz was for centuries a part of the great empires of Islam from the Umayyads to the Ottomans. ^ Quran: 7:73–79; 11:61–69; 26:141–158; 54:23–31; 89:6–13; 91:11–15. ^ a b c d e Merriam-Webster's Geographical Dictionary. 2001. p. 479. ISBN 0 87779 546 0. Retrieved March 17, 2013. 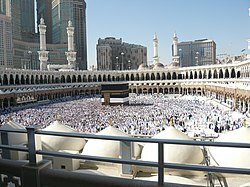 ^ "Mecca: Islam's cosmopolitan heart". The Hijaz is the largest, most populated, and most culturally and religiously diverse region of Saudi Arabia, in large part because it was the traditional host area of all the pilgrims to Mecca, many of whom settled and intermarried there. ^ "Saudi Arabia Population Statistics 2011 (Arabic)" (PDF). p. 11. Archived from the original (PDF) on November 15, 2013. ^ a b Britain and Saudi Arabia, 1925–1939: The Imperial Oasis. p. 12. ^ a b Beranek, Ondrej (January 2009). "Divided We Survive: A Landscape of Fragmentation in Saudi Arabia" (PDF). Middle East Brief. 33: 1–7. Retrieved April 15, 2012. ^ Gajus Scheltema (2008). Megalithic Jordan: an introduction and field guide. ACOR. ISBN 978-9957-8543-3-1. Retrieved October 5, 2012. ^ Sullivan, Walter (March 30, 1993). "Science Watch; Signs of Ancient River". The New York Times. Retrieved June 25, 2014. ^ a b Kesting, Piney. "Saudi Aramco World (May/June 2001): Well of Good Fortune". Retrieved April 7, 2014. ^ a b Butler, J. W. S.; Schulte-Peevers, A.; Shearer, I. (October 1, 2010). Oman, UAE & Arabian Peninsula. Lonely Planet. pp. 316–333. ^ "Al-Hijr Archaeological Site (Madâin Sâlih)". UNESCO. Retrieved April 7, 2014. ^ Hizon, Danny. "Madain Saleh: Arabia's Hidden Treasure – Saudi Arabia". Retrieved September 17, 2009. ^ "ICOMOS Evaluation of Al-Hijr Archaeological Site (Madâin Sâlih) World Heritage Nomination" (PDF). World Heritage Center. Retrieved September 16, 2009. ^ "Information at nabataea.net". Retrieved September 17, 2009. ^ a b Lings, Martin (1983). Muhammad: His Life Based on the Earliest Sources. Islamic Texts Society. ISBN 978-0-946621-33-0. ^ Karen Armstrong (2002). Islam: A Short History. p. 11. ISBN 0-8129-6618-X. ^ a b Firestone, Reuven (1990). Journeys in Holy Lands: The Evolution of the Abraham-Ishmael Legends in Islamic Exegesis. Albany, NY: State University of NY Press. ISBN 978-0-7914-0331-0. ^ a b al-Tabari (1987). Brinner, William M. (ed.). The History of al-Tabari Vol. 2: Prophets and Patriarchs. Albany, NY: State University of NY Press. ISBN 978-0-87395-921-6. ^ a b c d e f g h i j k l m Mubarakpuri, S. R. (2002). "The Compensatory 'Umrah (Lesser Pilgrimage)". Ar-Raḥīq Al-Makhtūm ("The Sealed Nectar"). Darussalam. pp. 127–47. ISBN 9960-899-55-1. Archived from the original on August 20, 2011. Retrieved October 6, 2014. ^ Witness Pioneer "Pre-Badr Missions and Invasions"
^ "Muhammad". Encyclopedia of Islam and the Muslim world. ^ "Al-Baha City Profile". The Saudi Network. Retrieved October 2, 2012. ^ "Brief about Ta'if City". Ta'if City (in Arabic). Taif Municipality. Retrieved April 26, 2016. ^ "Rābigh". GeoNames. Retrieved November 28, 2017. ^ "Al-Juhfah | Hajj & Umrah Planner". hajjumrahplanner.com. Retrieved April 10, 2017. ^ "Tabouk City Profile, Saudi Arabia". The Saudi Network. Retrieved May 4, 2017. ^ "Construction underway on Saudi Red Sea project site". February 27, 2019. Retrieved March 31, 2019. ^ "Red Sea project master plan wins approval". September 17, 2017. Retrieved March 31, 2019. ^ "Hospitality is 'anchor' of Red Sea project". January 27, 2019. Retrieved March 31, 2019. ^ "Saudi Arabia to allow women in bikinis at new beach resort". August 4, 2017. Retrieved August 14, 2017. ^ Riedel, Bruce (2011). "Brezhnev in the Hejaz" (PDF). The National Interest. 115. Archived from the original (PDF) on November 15, 2013. Retrieved April 23, 2012. ^ "The Infallibles Taken from Kitab al Irshad By Sheikh al Mufid". al-islam.org. Retrieved November 20, 2008. ^ Maqsood, Ruqaiyyah Waris. "The Prophet's Line Family No 3 – Qusayy, Hubbah, and Banu Nadr to Quraysh". Ruqaiyyah Waris Maqsood Dawah. Retrieved July 1, 2013. ^ a b Ibn Hisham. The Life of the Prophet Muhammad. 1. p. 181. ^ "Adab of Islam". Masud. Retrieved August 8, 2017. ^ a b c Maqsood, Ruqaiyyah Waris. "The Prophet's Family Line No. 4 – Amr (Hashim), the Founder of the Hashimites". Ruqaiyyah Waris Maqsood Dawah. Retrieved August 3, 2011. ^ a b c d e f g Chittick, William C. (1981). A Shi'ite Anthology. SUNY Press. ISBN 978-0-87395-510-2. ^ Jaffer, Masuma (2003). Lady Fatima Masuma (a) of Qom. Qum: Jami'at al-Zahra: Islamic Seminary for Women. ^ "Pusat Sejarah Brunei" (in Malay). www.history-centre.gov.bn. Archived from the original on April 15, 2015. Retrieved August 23, 2016. Mackey, Sandra (2002), The Saudis: Inside the Desert Kingdom, New York: W.W. Norton and Company, ISBN 0-393-32417-6 PBK, first edition: 1987. Updated Edition. Norton Paperback. 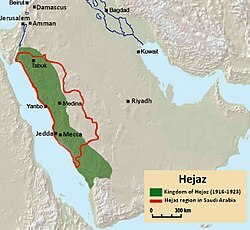 Wikimedia Commons has media related to Hejaz. "Hejaz" . Encyclopædia Britannica (11th ed.). 1911.